Franklin Delano Roosevelt (FDR) is to liberals as Ronald Reagan is to conservatives, a greatly revered hero of their cause. Barack Obama is following in FDR’s shoes. Roosevelt was more destructive to the economy in his own time than Obama has been in his… thus far. Roosevelt responded to the recession he inherited with a combination of massive spending on new government programs and sweeping controls over private industry, (sound familiar?). His thinking was that government spending would get people back to work, and controls over private industry would end deflation. Rules and regulations over private industry were put in place designed, incredibly, to increase the prices of goods. The President and his advisors thought deflation was a cause of the recession. But of course it wasn’t a cause; it was a result. The Works Progress Administration (WPA) and the Civilian Conservation Corps (CCC) were formed. The WPA was created to carry out infrastructure projects (sound familiar?) and the CCC to provide government jobs for young men by performing work of a conservation nature on government-owned land. The WPA and CCC were prime elements of FDR’s stimulus program. Both programs increased the size of government and added to the Federal payroll but did little for private industry which is the heart of an economy. FDR created a Farm Board with the power to control the amount of production and the price of grains and livestock. The board mandated that crop farmers let some of their fields lie fallow. Agriculture farmers were paid by the government for crops that didn’t exist because they were forbidden to plant them. Livestock farmers were not overlooked either. Six million young piglets were ordered destroyed at taxpayer expense. The purpose was to reduce the supply of pigs and increase the price of bacon and pork. Instead of pigs, Obama chose to destroy used cars. At least that move is more humane. But the NRA turned out to be a step too far. In an attempt to end the controversy surrounding the program, Roosevelt chose to make an example of a kosher chicken processing firm run by two immigrant brothers in Brooklyn, NY. The proprietors were arrested, tried, found guilty and jailed for selling chickens at prices below those allowed by the law and for permitting wholesale customers to pick and choose which birds they wanted to buy. Both acts violated regulations set by the National Recovery Administration. The strategy backfired when the proprietors, the Schechter brothers, fought back. The case went to the Supreme Court where, by a unanimous decision, the National Industrial Recovery Act was declared to be unconstitutional. The NRA which administered the Act was dismantled. Today we see parallels in Obama’s use of czars and broad powers of regulation to control the private sector. If the question of the constitutionality of the Patient Protection and Affordable Care Act, commonly known as ObamaCare, winds up in the Supreme Court it will be one more instance of Roosevelt redux. Eight years after Roosevelt was first elected, unemployment stood at 14.6%. Henry Morgenthau, Jr., FDR’s Secretary of the Treasury from 1934-1945, admitted to himself in a written in his personal diary that the stimulus spending programs had failed. Then on December 7th 1941, Japan attacked Pearl Harbor. The unemployed went back to work. Assembly lines ran around the clock making tanks and planes, guns and ships in the all-out war effort. FDR, already the only President to win a third term, went on to win a fourth. 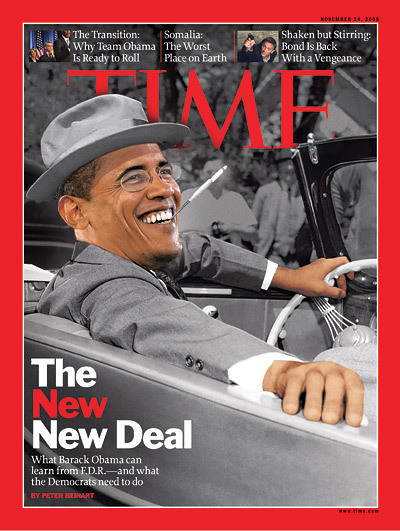 Obama is treading the same path as FDR, repeating the same steps that turned a recession into the Great Depression. But fear not; we survived the Civil War, Woodrow Wilson, Franklin Roosevelt and World War II. We’ll survive Barack Obama as well. But we must make certain he only reigns for one term. This article was first published in American Thinker on June 14, 2011 and is reprinted verbatim here. This entry was posted in Opinion, Political philosophy and tagged Barack Obama, Franklin D Roosevelt, Great Depression, NRA, WPA. Bookmark the permalink.